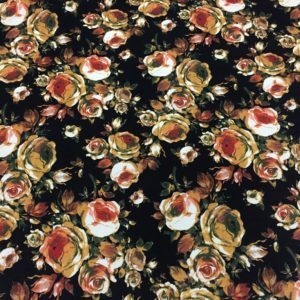 Home / Fabric / Stretch Velvet Knit with Rose Floral Print, 2 3/4 Yard Piece. Velvet Knit, a decadent floral print of Roses in Pink, Red and White that go across the piece in a row; all on a Black background, an incredible contrast. Soft hand, medium weight for a knit (5 ounces), this is an innovative piece for every day use. Polyester/Lycra Blend, 2-Way stretch, 63″ wide. Use this as you would any knit or broadcloth/dress weight woven with stretch. A 2 3/4 Yard piece, two repeats, but the second one has some cuts.